Data point: Full-blown personality disorders such as sociopathy, psychopathy, narcissism and borderline disorder tend to occur co-morbidly; meaning if you have one, you probably have at least two. (Narcissist/sociopath is a common constellation, as is borderline/histrionic). Related data point: Most experts in matters of the human psyche agree that personality disorders are not congenital. They are forged, probably built in early childhood by repeated, systematic destabilization of the child’s developing ego. This fact could almost make you feel sorry for a person with a full-blown personality disorder, except that they are so effing destructive that feeling sorry for them is somewhere between insane in its own right and impossible. There are a few moments in The Assassination of Gianni Versace where the temptation to feel pity for whatever happened to create the freakish empty husk that is Andrew Cunanan is relatively strong. Several such moments occur in tonight’s episode, “Descent.” Then you’re inevitably visited by a character he’s killed in a previous episode, and all you can do is feel sorry for the whole damned world. 1996. La Jolla, Calif. Fancy car pulls up to opulent beachside mansion. 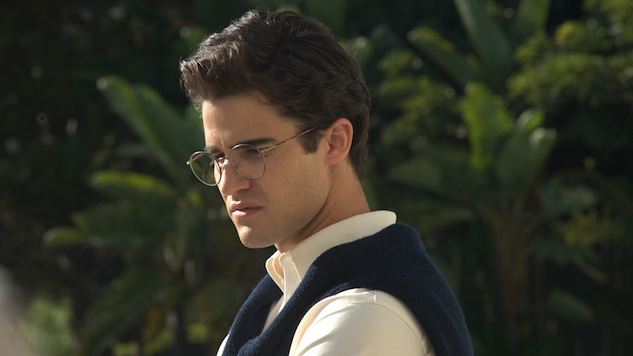 Cunanan (the increasingly chilling Darren Criss) swaggers out of the car and into the house, cold and arrogant, swinging glossy shopping bags from Ferragamo, then strips naked and dives into a swimming pool. (Laura Branigan’s “Self Control” has never been used to more perfect effect.) He rubs leftover coke residue on his gums in giant walk-in closet, carefully wraps a gift, and gets dressed. Andrew is definitely living large, his creepy grandiosity in full flow. A situation you’d think he probably wants to maintain. It is one year before the murders of David Madson, Jeff Trail, Lee Miglin, William Reese and Gianni Versace. “Who are you trying to be?” Lizzie asks, plaintively. She cares. For a second, you almost care, too. You wonder what happened in his house, his home, his school-kid days, his past. Something creepy, no doubt. “Someone he can love,” Andrew replies. Data point: Sociopaths and psychopaths are very similar. But not the same. Both have unstable egos, a shifting and uncertain sense of self that can explode into abrupt displays of grandiosity, excessive risk-taking behaviors, wild tapestries of lies, or rages. Some people with these disorders are aware that they have them, aware that they do not experience normative human emotions; some are not. But a sociopath is highly unlikely to murder you; serious physical violence is in the deck with psychopaths. Adding insult to injury, he tells Jeff that as far as David knows, Jeff’s a naval officer. “You want me to impersonate an officer?” The look of pain and confusion on Trail’s face as it seems to dawn on him that he has tied his coming out to someone who doesn’t remotely understand what it took for him to leave the military and now wants him to pretend to be the person he was when he had to pretend he wasn’t gay—wow, that is a stone with a wide, wide ripple effect. He’s so freaking honorable and good. You’d want to jump into the scene and get him the hell away from Cunanan even if you didn’t know his cranium had a blind date with a hammer coming in a year. David shows up. As an architect, of course, he’s blown away by the sleek, capacious, glass-walled house, the lawns and clusters of banana trees sweeping toward the ocean—he’s wondering how Andrew’s pulled this off. Then, never one to disobey an order, Jeff “gives” Andrew the shoes, Andrew makes a humiliating fuss about them, and for some reason, with all his attention to detail, it has not occurred to Andrew that Jeff and David, two attractive, honest, non-desperate men, will hit it off instantly. And it all starts to unravel. Norman’s bitchy friend corners Andrew and lets him know he’s wise to his shtick. Jeff and David are enjoying each other’s company way too much. Lee Miglin (Mike Farrell) shows up and Andrew makes a big display of not recognizing him. (Lee’s faintly desperate to be alone with Andrew; it’s also hard to watch, knowing what’s coming). Lizzie snaps a picture of all of them, Jeff and David with their arms already around each other and rage beginning to simmer in Andrew’s eyes. Andrew does not get his list of demands, smashes a glass table, and leaves in a seething rage. Jeff tells Andrew he’s moving to Minneapolis—though it’s not for David, he says. He wants to be closer to home and he’s tired of the heartbreak of seeing naval ships in port. Andrew of course takes it in a spirit of goodwill and equanimity. Actually, no, he doesn’t. He sneers and acts betrayed and screams at Jeff to stay away from David. Andrew goes back to the fleabag motel he’s been camping in since he left Norman. His failed attempt to seduce David has cost him almost $30,000. “Was it the world, sir?” Versace replies placidly. Even high out of his mind on meth, Andrew Cunanan finds himself not measuring up. And now the drug dealer wants money Andrew doesn’t have. So he goes back to Norman’s house. But he can’t get in. He screams at Norman through the locked glass doors while Norman calmly picks up the phone to call the police. There’s only one place left to go. At least his mom (Joanna P. Adler) is happy to see him. She’s a little mentally unstable, but she’s glad to see him. She bathes him and sings an Italian lullaby, says he doesn’t smell like himself any more, and attempts to wash the not-him smell off. She tells Andrew how other moms are jealous because her son is touring the world with Gianni Versace, designing for operas. She is overwhelmed with pride over the things her son has done. Andrew becomes more and more visibly miserable. She doesn’t notice. In the morning a seriously frayed and unstable Andrew Cunanan drives away, saying he’s going to Minneapolis. One of the things that makes someone’s personality “disordered” versus “eccentric” is whether or not they are capable of internal validation. Narcissists, for example, have to constantly seek reflections of themselves in other people because they fundamentally do not know who they are; they lack a stable ego. Of course, there are lots of people who don’t have personality disorders who struggle with internal validation at least sometimes—hell, maybe it’s 100% of us. And probably everyone has had the experience of feeling rejected, unloved or unlovable. Maybe especially if you find yourself in any kind of demographic category that isn’t always accepted by others. This episode is about love. Sometimes when people can’t locate any within themselves they have a hard time finding it in others. Occasionally, someone is driven actually insane by this, and might even do something unspeakable. We already know what’s going to happen to Andrew Cunanan. I wonder if he does.